Location of legendary chests in Assassin’s Creed Odyssey are very important because they contain a set of Legendary gear called the Pilgrim’s Set and a Legendary bow and weapon. There are many chests in the game and some of them contain loot that is of epic quality, but there are only 17 legendary chests. It took a long time for us to find just a few because they do not appear in what seem to be very important places in the game world. You are just clearing out one of the POIs and all of a sudden – legendary chest. Pilgrim’s legendary gear set is also great for assassin type players since getting it all will unlock “-40% adrenaline consumed by Shadow of Nyx ability” engraving. In this guide we’ll show you the location of all Legendary Chests in Assassin’s Creed Odyssey and what they contain. This will also spare you some helix credits so you don’t have to buy a map of them in the shop. Pilgrim’s belt can be found in the Temple of the Golden-Bowed Goddess. It is an item that will drop at a bit of a lower level than your character’s current level. Its bonuses are “+13% Assassin Damage” and “+20% Adrenalin on Assassination Kill”. These bonuses may different in power depending on the level you picked this item up at. The temple where this legendary chest is located at is in the region of Malis, Pandora’s Cove sub-region. It is protected by several huntresses. This POI also contains an ancient tablet. There is a synchronization point next to it called Ruins of Artremis. From there jump down and go southwest. Clear the camp and you should see the chest out in the open. From Ruins of Artemis viewpoint you will see the legendary chest. For the Pilgrim’s Hood you have to go to western part of Attika. I got there by fast traveling to Megaris main city viewpoint and going east from there. You want to reach Eleusis Telesterion in Sacred Plain of Demeter sub-region. There’s a big temple there and inside it you will see a separate structure with two big statues at the entrance. Inside the small tomb is the legendary chest containing the Pilgrim’s Hood. It gives +13% assassination damage and +12% damage with daggers. These bonuses scale with the level at which you pick the item up. When we were level 41 this item was level 37. Go inside Eleusis Telesterion and inside a chamber with two statues in front of it is the chest. To find the Pilgrim’s Garment Legendary Chest location in AC Odyssey, you’ll have to go to the city of Sparta, in central-north Lakonia. Inside the city of Sparta, in the northwest corner, there’s the Temple of Athena Chalkioikos synchronization point. Immediately to the west of the synch point is the Temple of Athena. 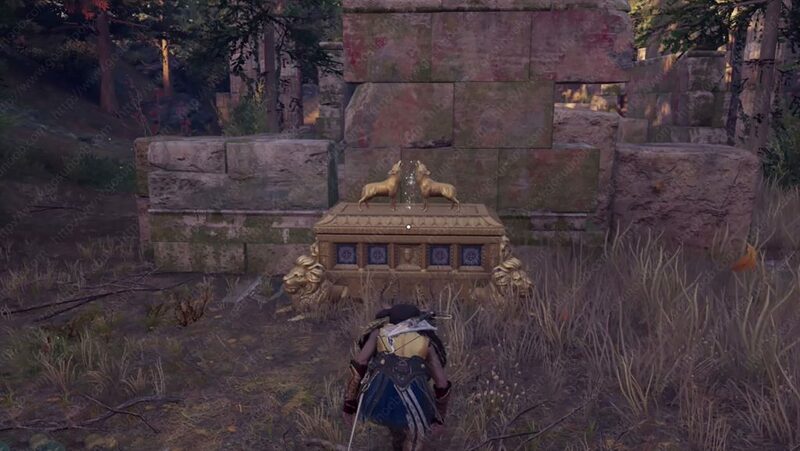 Go inside the temple (you’ll have to go all the way around if you’re approaching from the synch point), and you’ll find the legendary chest with the Pilgrim’s Garment at the base of the statue of Athena. The Pilgrim’s Garment adds 13% Assassin Damage and +20% Adrenaline on Assassination kill. The required level was 36, and we were level 34 at the time we got it. Legendary chest containing Pilgrim’s Gloves is found inside Akropolis of Argos. This is inside the city of Argos in Argolis region. Fast travel to Temple of Poseidon Synchronize location and head west of there then go up the hill until you reach the Akropolis. Once inside the building go up the stairs and to the right to find the legendary chest. Pilgrim’s Gloves have bonus to Assassin Damage and +12% Adrenaline per Hit at level 40. Level 40 is the highest level you can get them at. You need to visit the Temple of Britomartis in western Messara to get the final piece of Pilgrim’s Legendary armor set. Cehst is at the northern tip of the temple. Boots provide Assassin Damage bonus as well as 16% Movement Speed while Crouching. This makes them the perfect assassin play-style gear. Their level was 37 when we picked them up at level 41. These are the only part of the Agamemnon Legendary armor set that are not found on Cultists. To get Agamemnon’s Gauntlets and complete the set you’ll have to find a legendary chest in the region of Attika. You need to find Lavrio Silver Mine point of interest in southern Attika. Go inside the mine and keep going straight until you reach the very end of the mine. There is some wooden stairs and scafolding there. Climb up the stairs and then climb up the wall to reach the platform above the stairs. This is where the chest is at as well. If you want the legendary Achilles’ Spear you have to go to Olynthos Fortress. This point of interest is located in northern Makedonia in the Unexplored Mount Pangeon sub-region. Olynthos Fortress is heavily guarded by high level guards that are around level 41. Approach the fort from the north and the legendary chest is inside one of the houses inside, just as you jump over the protective walls. It is on the ground floor marked clearly on the map bellow. Spear adds 15% damage to hunter and spear damage. It also unlocks a special +20% damage with multi-shot ability engraving . Herakles’ Bow is found inside Koinyra Fortress. This heavily guarded fort is located on the island of Thasos. Fast travel to Thasos Temple synchronize POI there and then go east and a bit north of it. There is a guard tower in the middle of the fort that has the aler pyre on top of it. You can conveniently use a rope to slide on top of its roof. USe a little opening in the roof to enter the room bellow and the legendary chest is there. Herakles’ Bow is really cool looking and provides 15% warrior damage and 10% damage with bow charged shot bonus. It also unlocks a new +20% damage with Bull Rush ability engraving. Its minimum level is 46 so no rush to get it until late in the game, unless you want to unlock the engraving early. Watch out for level 46+ enemies though. Hades’s Bident is in the Mount Ithome Fort, in the center of Exile Hills, the section in the west of Messenia. Messenia is the region west of Lakonia. We approached the Mount Ithome Fort from Vista of Pylos, a synchronization point to the east of fort. In the northeast of this fort, near the top, there’s a stone house, with a table in the middle. There are parchment shelves on the walls, and some rolls on the table. The legendary chest is in the side room you can access from the house. The Hades’s Bident grants +13% Warrior Damage, +20% CRIT damage, and +20 Damage with Ring of Chaos Ability . It is a level 40 legendary weapon. We also go the +20 damage with Ring of Chaos Ability engraving. This golden bow can be found in a legendary chest located inside Andania Mine. This point of interest is found next to Temple of Zeus sync point in Messenia region. From the synchronization point head south and then you should see two entrances into the mine. Take the left one. Follow the path and take a right at the first fork. Keep descending into the mine until you enter a big chamber with wooden stairs and scaffolding in the middle. Legendary chest is to the left, in the southwest part of that cave. Obtaining Eros’s bow unlocks 50% chance to not Consume Special Arrows engraving. It also has bonuses for Hunter damage and adds 15% Adrenaline per Hit. Region of Arkadia is your destination if you are determined to find HEarkles’s Mace and the legendary chest it is in. Go to the Sanctuary of Athena Polias sync point and move west of it until you reach the Temple of Demeter and Kore point of interest. Legendary chest is inside the temple in plain view. Getting this Assassin’s Creed Odyssey legendary heavy blunt weapon unlocks +40% Damage with Bows when Above Target engraving. This might sound strange that a blunt weapon as this has bonuses for hunter players, but that trend continues with other bonuses. They are bonus to Hunter damage and +12% Adrenaline per hit. Its max level seems to be 40. You need to visit Argolis region and its famous palace of Agamemnon to find this legendary weapon. Surprisingly, palace of the famed king that attacked Troy to reterive his wife is not home to one of the Legendary armor pieces from his legendary set in the game. Instead you get to find this amazing looking legendary heavy blunt weapon that warriors will adore. Get to the palace and climb up on top of it then descend to the ground floor through the holes in the roof and floors. Bonus engraving you unlock with Hammer of Jason gives +20% Damage with Shield Break Ability. Weapon itself has +15% Warrior Damage and +15% Damage with Heavy Blunt Weapons. May the pummeling commence. This spear is located in a most unusual place. Legendary chest is located inside Palace of Amphitrite, but the palace is located at the bottom of the sea. You will need to look for an underwater location POI northwest of the island Thera. At the location on the map just dive down and to the very bottom of the temple. Chest also contains Scions and Cult of Kosmos skins for your Adrestia crew. Falx has one of the most interesting engraving unlocks in the entire game. It reminds of the Cursed weapons from Assassin’s Creed Origins. Falx of Olympos engraving provides the following bonus: +100% Damage but Health Capped to 25%. This gives a whole new meaning to the term glass cannon. You also get some Assassin Damage and Adrenaline per CRIT bonuses. This legendary chest is located on the island of Kos. You can find it in the center of the game map all the way to the east in the Southern Sporades region. Chest is in the middle of the island, inside Artemisia fort. Scan the fort with Ikaros and you should find the chest in the northern part of it. It is hidden away inside a broken down building there. Possessing this sword unlocks +20% Damage with Rush Assassinate Ability engraving. Sword provides bonuses to Assassin Damage and adds bonus on Adrenaline per CRIT. This sword is fabled to have accompanied Peleus, father of Achilles, in all of his bloody battles. This is one of the most interesting legendary items in the game because its bonus lets you breathe underwater indefinitely. Before you decide on going to explore all underwater locations in the game you might consider getting and equipping Poseidon’s Trident first. It is found in a legendary chest located inside the Temple of Poseidon on a small island that doesn’t even have a name. It is located on the eastern edge of the game’s map. Best check out the provided map screenshot for its location. Last two chests contain legendary ship customization. The Hound of Hades will paint your sail white and have the three headed hound prominently displayed in blue. Its description reads as follows: Cerberus was the mythical multi-headed dog that guarded the gates of the underworld, preventing the dead souls from returning to the world of the living. To find it you will have to visit the region of Lakonia. Go to the tip of the eastern peninsula. There’s an underwater point of interest near there. Jump into the water and swim toward the POI and then dive while you are still close to the shore. Legendary chest is located closer to the shore than to the underwater location’s icon. Dive down and open the legendary chest to make Adrestia’s looks legendary. The Minoutaur’s Revenge turned out to be a legendary ship customization found in a legendary chest in an Underwater Cavern in Makedonia. This POI shows up as being on the coastline, but there is an easier way to find the entrance. Go to the location shown on our screenshots bellow and there’s a hole there you can climb down into. From the ladder go straight and at the first fork turn left. There’s a little pool real close by that you should jump into. You will find the legendary chest at the bottom of it. The Minoutaur’s Revenge changes the appearance of your ship, most notably the sails. Find the entrance into the Underwater Cavern here. Once you descend down the ladder go straight and turn left atr the wall. Jump into the water as soon as you see it. Legendary chest containing Minotaur’s Revenge is at the bottom. 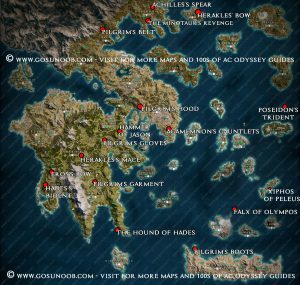 Just in case above explanations and map screenshots weren’t enough we wanted to share a map of all legendary chest locations in Assassin’s Creed Odyssey. This map can be purchased in the game for helix credits, but we wanted to spare you a few bucks and provide you with this resource online. If you have trouble with finding legendary chests in any of the locations displayed bellow please refer to the 2000+ word article above.